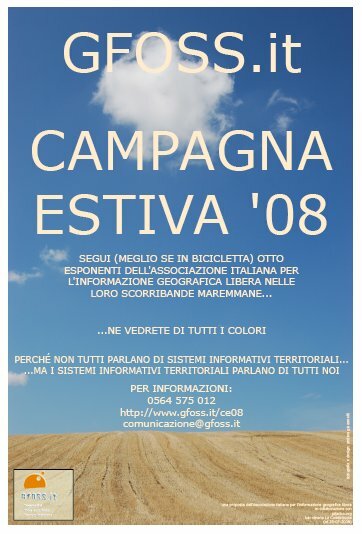 In August 2008 I coordinated and promoted the Summer Campaign for GFOSS.it, the Italian OSGEO Chapter. The operation implied our presence with a stand at Festambiente, close to Grosseto, Southern Tuscany, one of the largest festivals run by environmental activists in Italy. To manage shifts (ten days, each day from 4.30 PM to midnight), we set up a team of eight volunteers, coming from various parts of Italy. Our base camp was in Tatti. Those who were not assigned to a shift, did whatever they wanted, typically coding or mapping in the fields. The image used for the flyer of the Summer Campaign plays with the double meaning of the word “campagna” in Italian, which stands both for “campaign” and “countryside”. The photo was taken by me South of Scansano, again in Southern Tuscany, a couple of years earlier.